A.J. Ramos is third in the National League with 32 saves this season. 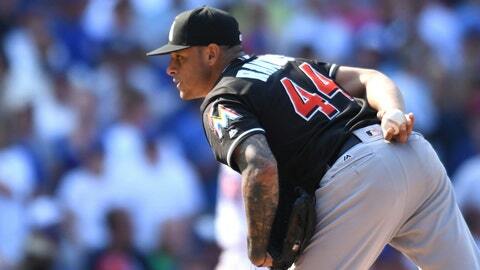 MIAMI (AP) — The Miami Marlins have placed All-Star closer A.J. Ramos on the 15-day disabled list with a right finger fracture. The move was retroactive to Aug. 6, and Ramos, who has 32 saves in 34 opportunities, would be eligible to return on Aug. 21. "It got kind of funny at the end because one day it would feel OK and then the next day it wouldn’t, and then it wasn’t two day in a row," manager Don Mattingly said Tuesday. "We were trying to hold off and give him three days here this series and the off day, and hopefully (Friday) we would be ready to go, but with last night we decided we had to do this and bite the bullet." Fellow All-Star reliever Fernando Rodney, who has 18 saves in 20 chances primarily with San Diego, will assume the closing duties with Ramos out. The Marlins lost to the Giants 8-7 in 14 innings on Monday using all seven relievers except for Ramos, who was unavailable. Friday’s starter, Andrew Cashner, was eventually used in relief in place of Ramos. The Marlins optioned left-handed pitcher Hunter Cervenka to Triple-A New Orleans and recalled right-hander Austin Brice from that team. They selected the contract of left-hander Chris Narveson, also from New Orleans.